Capital of the Turkish vilayet of the same name, which is situated in lower Mesopotamia on both sides of the Tigris. The vilayet formerly extended from Diabekr to Yemen, with the Persian frontier as its eastern border; but in 1878 the vilayet of Mosul was separated from it, and in 1884 also that of Bassora. According to Arabic tradition, the town of Bagdad was founded in the middle of the eighth century by the Abbassid calif Abu Ja'far Manṣur. But the fact that a Babylonian city named Bagdad is already mentioned in the Talmud (Ket. 7b, Zeb. 9a) proves that the calif Manṣur only rebuilt and enlarged the old Persian City of Bagdad. That Bagdad was originally a Persian city is also proved by the name, which is Persian. Being situated on the left bank of the Tigris, the town was in close proximity to the two centers of Jewish spiritual life, Sura and Pumbedita. As the calif was anxious to see the population of his new residence increase, he offered no resistance to Jews settling there and forming a community. They became so numerous that one of the bridges over the Karkhâyâ canal in the western suburb was called "Ḳanṭarah-al-Yahūd" or Jews' Bridge, also Bridge of the Jews' Fief (G. Le Strange, "Baghdad under Abbaside Caliphate," p. 150), and Yaḳut mentions that the Jewish quarter, called "Dar al-Yahūd," was in the neighborhood (iv. 1045). The Jews were, of course, occasionally troubled by revivals of the restrictions to which non-Moslems were subject. These regulations were first renewed by Harun-al-Rashid (786-809), who ordered that Jews and Christians should wear distinguishing marks on their clothing, refrain from riding on horseback, and suffer other similar humiliations. Afterward these restrictions were relaxed, but were again imposed by Al-Mutawakkil (880), who went so far as to convert the synagogues into mosques. Notwithstanding this, Jews are found holding state offices under Al-Mutaḍid (892-902). As the seat of the califate, Bagdad soon rose to a conspicuous height. It was a home for Jewish learning; and a number of men prominent in the history of that time had their home there. Aaron ben Samuel ha-Nasi, of Babylon, the mystic of the ninth century, came to Italy from this city (Graetz, "History of the Jews," Hebrew transl., v., Appendix, p 46). Its importance at the time of the Geonim must not be underrated, as it is often mentioned at this time under the name of "Babylon" ( ) (see Babylonia). (On the name , see Steinschneider, "Polem. und Apolog. Lit." p. 293; idem, "Hebr. Bibl." xiii. 90; "Jewish Quarterly Review," xii. 115). Bagdad belonged rather to Pumbedita than to Sura; but the heads of the Jewish community in both places came to the calif's city in order to swear allegiance to the "resh galuta" or exilarch (Geiger, "Wissenschaftliche Zeitschrift," v. 398; Grätz, "Gesch. der Juden," v. 479). The Jews of Bagdad must have been affected by the Karaite schism. Ishmael of 'Akbara (c. 840) came from a place only seven miles from the city; and Abu al-Sari Salḥ ben Maẓliaḥ (eleventh century) preached publicly in the streets against the Rabbinites. He was answered in the same way by Jacob ben Samuel (Graetz, "History of the Jews," Hebrewtransl., iii. 311). Abu Imran al-Za'farani, the founder of a new sect, was born in Bagdad in the ninth century (Graetz, ib. iii. 508). At the time of the calif Al-Mutaḍid the Jews of Bagdad fared well on account of the kind treatment accorded to them by the vizier 'Ubaid Allah ibn Sulaiman. The heads of the community were Joseph ben Phineas and Natira (Graetz, ib. iii. 274). The gaon Aaron ibn Sargada (943-960) came from Bagdad, and it was here that his relative, Kasher ibn Abraham, was called upon to settle a dispute in which he had become involved (Graetz, ib. iii. 306, 308). About the year 950 the grammarian Dunash ben Labraṭ was in Bagdad; and in this city the gaons Ḥai, Kimui bar Rab Aḥai, and Yehudai bar Samuel were officials ( ) before going to Pumbedita. According to Ḥai (died 1038) the Bagdad Jews of his day were accustomed to say the 'Abodah of the Day of Atonement both at the morning and musaf service (Graetz, ib. iii. 166). It is also probable that the exegete and traveler Abraham ibn Ezra visited Bagdad between the years 1138 and 1140 (see his commentary to Ex. xxv. 18). Ibn Ezra's son Isaac, who probably came with him, and was baptized, wrote in Bagdad (1143) a poem in honor of another convert, Nathaniel Hibat Allah ("Kokbe Yiẓḥaḳ," 1858, p. 23; Graetz, "History of the Jews," Hebr. transl., iv., Appendix, p. 47). During the twelfth century the Jews of Bagdad attained again some measure of self-government. The calif Al-Muktafi appointed a wealthy man, Samuel ben Ḥisdai, exilarch in Bagdad. He gathered the taxes, paying a certain portion over into the state treasury; and all important appointments had to receive his sanction. Both Benjamin of Tudela and Pethahiah of Regensburg visited Bagdad, and have left interesting information regarding the Jews there. According to Benjamin, there were at his time in the city 23 synagogues, 1,000 Jewish families, and 10 yeshibot (rabbinical schools). According to Pethahiah, however, "At Bagdad there are three synagogues, besides that built by Daniel on the spot on which the angel stood on the brink of the river, . . . as is written in the Book of Daniel." Pethahiah adds: "The head of the academy has many servants. They flog any one not immediately executing his orders; therefore people fear him. . . . He is clothed in gold and colored garments like the king; his palace also is hung with costly tapestries like that of the king." The most prominent heads of the yeshibot were at that time Ali and his son Samuel. David Alroy studied under Ali at the time Ḥisdai was exilarch (Wiener, "Emeḳ ha-Baka," pp. 27, 167; "Shebeṭ Yehudah," ed. Wiener, p. 50; Sambari, in Neubauer, "Medieval Jewish Chronicles," i. 123; Graetz, "History of the Jews," Hebrew transl., iv. 317). The reputation of Samuel seems to have spread far and wide; for we learn that Rabbi Moses of Kiev ( ) came from Russia especially to receive information from him (Epstein, in "Monatsschrift," xxxix. 511, 512; Graetz, ib. iv. 44). It was this same Samuel who, in later years, was a determined opponent of Maimonides, and who made Bagdad for the time a very hotbed of anti-Maimonist intrigue (Graetz, ib. Appendix, p. 34). Maimonides' favorite pupil, Ibn Aknin, had formed a plan of opening a school at Bagdad for the purpose of propagating his master's teachings. Maimonides, however, advised him against such an action, as he wished to spare him the opposition which he knew Ibn Aknin would encounter (Grätz, "Gesch. der Juden," vi. 362). Daniel, the son of Ḥisdai, followed his father in office: but he left no son; and though two of his cousins in Mosul pretended to hold office, the short-lived recrudescence of the resh galuta was at an end (Grätz, "Gesch. der Juden," vi. 460; Hebrew transl., iv. 459, Appendix, p. 59). The anonymous author of the Hebrew-Arabic Diwan published in "He-Ḥaluẓ," iii. 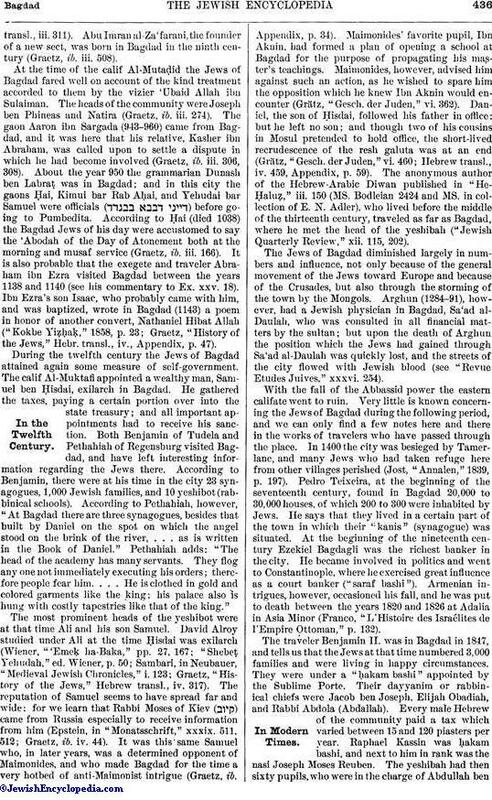 150 (MS. Bodleian 2424 and MS. in collection of E. N. Adler), who lived before the middle of the thirteenth century, traveled as far as Bagdad, where he met the head of the yeshibah ("Jewish Quarterly Review," xii. 115, 202). The Jews of Bagdad diminished largely in numbers and influence, not only because of the general movement of the Jews toward Europe and because of the Crusades, but also through the storming of the town by the Mongols. Arghun (1284-91), however, had a Jewish physician in Bagdad, Sa'ad al-Daulah, who was consulted in all financial matters by the sultan; but upon the death of Arghun the position which the Jews had gained through Sa'ad al-Daulah was quickly lost, and the streets of the city flowed with Jewish blood (see "Revue Etudes Juives," xxxvi. 254). With the fall of the Abbassid power the eastern califate went to ruin. Very little is known concerning the Jews of Bagdad during the following period, and we can only find a few notes here and there in the works of travelers who have passed through the place. In 1400 the city was besieged by Tamerlane, and many Jews who had taken refuge here from other villages perished (Jost, "Annalen," 1839, p. 197). Pedro Teixeira, at the beginning of the seventeenth century, found in Bagdad 20,000 to 30,000 houses, of which 200 to 300 were inhabited by Jews. He says that they lived in a certain part of the town in which their "kanis" (synagogue) was situated. At the beginning of the nineteenth century Ezekiel Bagdagli was the richest banker in the city. He became involved in politics and went to Constantinople, where he exercised great influence as a court banker ("saraf bashi"). Armenian intrigues, however, occasioned his fall, and he was put to death between the years 1820 and 1826 at Adalia in Asia Minor (Franco, "L'Histoire des Israélites de l'Empire Ottoman," p. 132). The traveler Benjamin II. was in Bagdad in 1847, and tells us that the Jews at that time numbered 3,000 families and were living in happy circumstances. They were under a "ḥakam bashi" appointed by the Sublime Porte. Their dayyanim or rabbinical chiefs were Jacob ben Joseph, Elijah Obadiah, and Rabbi Abdola (Abdallah). Every male Hebrew of the community paid a tax which varied between 15 and 120 piasters per year. Raphael Kassin was ḥakam bashi, and next to him in rank was the nasi Joseph Moses Reuben. The yeshibah had then sixty pupils, who were in the charge of Abdullah benAbraham Seumech. Though the Jews inhabited a certain quarter of the city, to live in that quarter was not compulsory upon them. Of the nine synagogues which Benjamin the Second mentions, eight were situated in one court; while the ninth was a large building, resting on sixteen columns, called "Bet ha-Keneset Sheik Isaac Gaon," in a side room of which building the body of that saint was interred. The trade of Bagdad with India was then largely in the hands of the Jews, who had manufactories in Calcutta, Bombay, Singapore, and Canton. This is corroborated by the evidence of the Rev. Henry A. Stern ("Dawnings of Light," p. 46, London, 1854), who says: "Jews are the governing element of the place. They have their stored booths in every bazaar, occupy all the principal caravansaries, and entirely control the business of banking and monopolies." Stern estimated the Jewish population in his day at 16,000, as against 1,500 Christians and 40,000 Moslems. The Jews were at that time divided into Persian and Arabian. On March 27, 1845, a "ḥerem" (ban) was launched against all who had any connection with the missionaries (compare "Narrative of a Mission of Inquiry to the Jews from the Church of Scotland," 1848, ii. 373). In 1860 H. Petermann of Berlin found 1,300 Jewish families in Bagdad, of whom 2,300 persons paid the poll-tax. The oldest Jewish families, he says, came there from Ana on the Euphrates. According to Cuinet ("La Turquie d'Asie," ii. 66, 97, 104) there were in the year 1890 53,800 Jews in the vilayet of Bagdad, of whom 52,500 lived in Bagdad, 500 in Hilla, and 800 in Kerbela. He gives the number of primary schools as 52, of synagogues as 26, and of cemeteries 2. 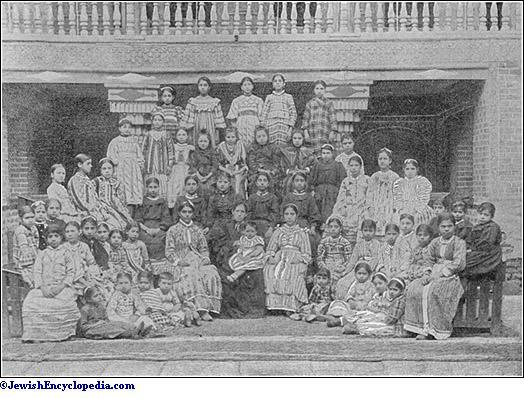 The women and young children were at that time engaged in manufacturing what is called the "agabani," a garment made of European stuffs embroidered with India silk. 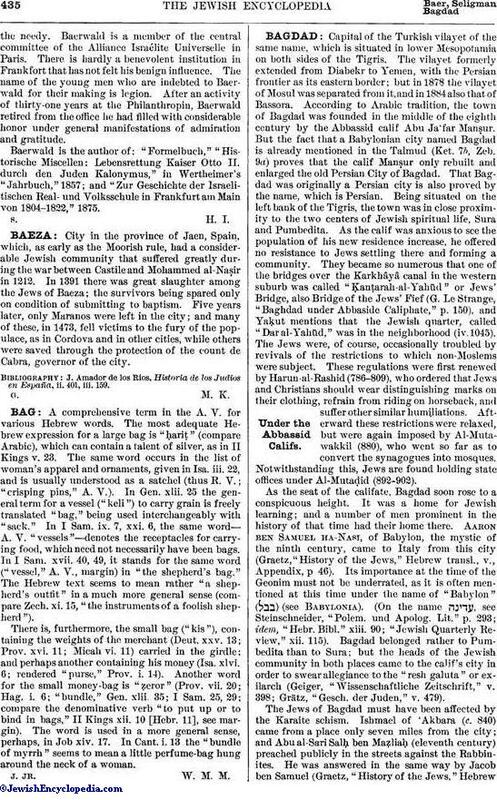 The trade in Babylonian and Assyrian antiquities is largely in the hands of the Jews of Bagdad (Delitzsch, "Babylon," 2d edition, 1901, p. 5). 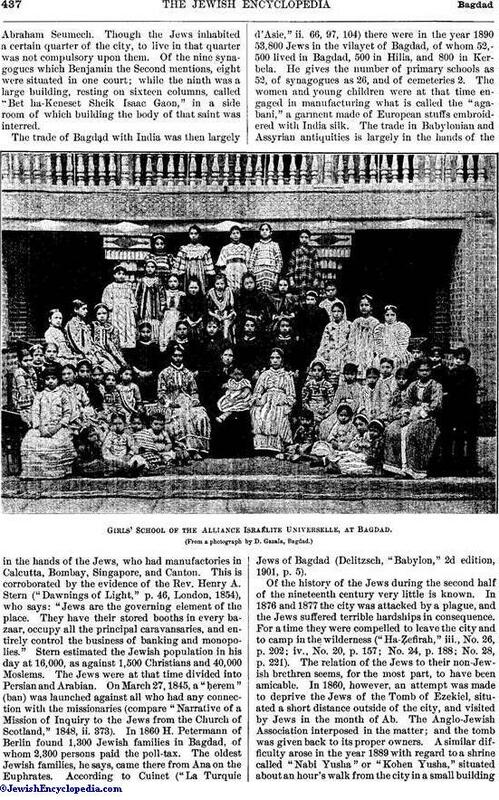 Girls' School of the Alliance Israélite Universelle, at Bagdad. Of the history of the Jews during the second half of the nineteenth century very little is known. In 1876 and 1877 the city was attacked by a plague, and the Jews suffered terrible hardships in consequence. For a time they were compelled to leave the city and to camp in the wilderness ("Ha-Ẓefirah," iii., No. 26, p. 202; iv., No. 20, p. 157; No. 24, p. 188; No. 28, p. 221). The relation of the Jews to their non-Jewish brethren seems, for the most part, to have been amicable. In 1860, however, an attempt was made to deprive the Jews of the Tomb of Ezekiel, situated a short distance outside of the city, and visited by Jews in the month of Ab. The Anglo-Jewish Association interposed in the matter; and the tomb was given back to its proper owners. A similar difficulty arose in the year 1889 with regard to a shrine called "Nabi Yusha" or "Kohen Yusha," situated about an hour's walk from the city in a small buildingshaded by eight gigantic trees. The high priest Joshua (Zech. iii. 1) is said to have been buried here; and, according to Teixera and Benjamin the Second, the Jews are accustomed to make pilgrimages thither every month. The shrine is maintained by the contributions of the Jews in Bagdad and in India, and is used not only as a synagogue, but as a burying place for the rabbis. One of the latter had been buried there in the year 1889, and because of a dispute as to whether the property really belonged to the Jews or to the Mohammedans, a persecution of the former was set on foot, and the principal Jews of the city, including the chief rabbi, were imprisoned by direction of the governor. A memorial on the subject was addressed to the marquis of Salisbury Oct. 25, 1889, on behalf of the Jewish Board of Deputies and the Anglo-Jewish Association, as a result of which the governor was removed. Other tombs similarly visited by the Jews of Bagdad are that of Ezra, near Gurna (Kurna), between Bagdad and Bassorah, and that of Daniel, near Hillah. In 1899 the Jews numbered 35,000 souls, with about 30 to 35 synagogues known by the name of "Torah." Each Torah had a ḥakam, a "mu'allim kabir" (senior teacher), and a "mu'allim ṣaghir" (junior teacher). The Alliance Israélite Universelle founded a school for boys there in 1865, which in 1899 had 254 pupils; in 1895 the same body founded a school for girls which in 1899 had 132 pupils. There is also a Jewish apprentices' school for the education of Bagdad boys along industrial lines. The study of English has been encouraged by a foundation made by Silas Sassoon, a member of the Sassoon family which has its origin in Bagdad, David Sassoon, the founder of the family, having been born there, 1793. During the last years of the nineteenth century a few Hebrew books have been printed in Bagdad, especially by Solomon Behor Ḥuṣain; e.g., (the second part of Solomon Almoli's work), 1892; of Isaac Farḥi; the story of Esther ( ), told in Arabic by Joseph al-Shamsani; of Sasshon Mordecai Moses; and on the wonders which happened in Palestine, taken from the . 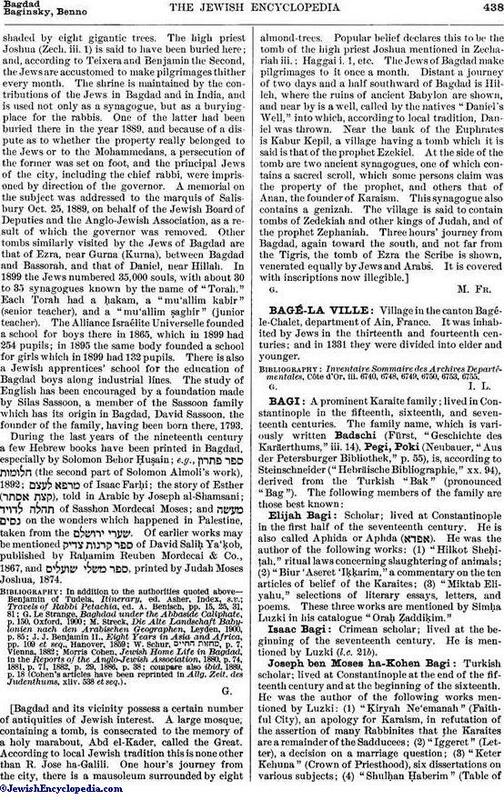 Of earlier works may be mentioned of David Saliḥ Ya'ḳob, published by Raḥamim Reuben Mordecai & Co., 1867, and , printed by Judah Moses Joshua, 1874.
compare also ibid. 1889, p. 18 (Cohen's articles have been reprinted in Allg. Zeit. des Judenthums, xliv. 538 et seq. ).